Bohemia Interactive today released Arma 3 Bootcamp – a major new update for Arma 3, which delivers additional single- and multiplayer tutorials, a Virtual Reality training environment, a character- equipment- and weapons-viewer called Virtual Arsenal, refinements to the fatigue and weapon sway game mechanics, plus the anticipated Addon integration for Arma 3’s Steam Workshop. The update is further introduced in the brand new Arma 3 Bootcamp trailer. The ‘Bootcamp’ singleplayer campaign is the best place to get started with Arma 3. Introducing the basic principles of infantry combat – actions, navigation, and weapon handling – a short prologue campaign challenges new players to complete real objectives. Multiplayer Bootcamp is a great way for veteran players to help newcomers adapt to Arma 3. Offering a structured set of challenges for both trainees and instructors, MP Bootcamp uses the Zeus framework to give players the tools they need to create a tutorial gameplay on-the-fly. VR Training enables you to learn about basic game mechanics within the confines of a virtual world and practice without penalty. A variety of training topics focus upon individual gameplay elements, where players are guided to complete simple objectives with the support of contextual hints and tips. Virtual Arsenal is a character, equipment and weapon viewer, which enables you to cycle through and try-out in-game assets, configure custom settings – such as identity types and insignia – and export loadouts to script or used in Arma 3 Zeus scenarios. 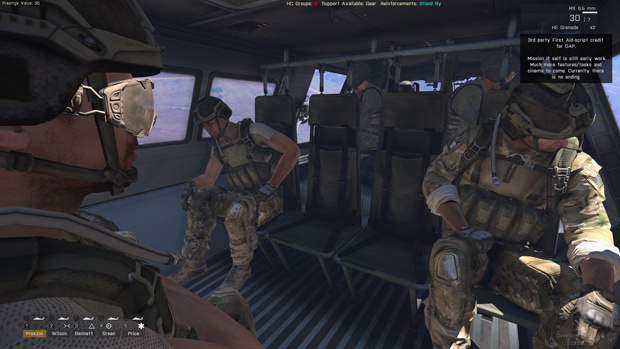 In addition to the new content, Bohemia Interactive also took the opportunity to further refine the fatigue and weapon sway mechanics in Arma 3. Weapon Sway and Inertia is intended to simulate the inherent advantages that lighter and more compact firearms possess (particularly in close-quarter situations) as compared to relatively more cumbersome weapons. For Arma 3, this means that players may turn as quickly as they like, but shouldn’t expect their sights to line up dead on target if they are carrying heavier weapons. The improvements to the Fatigue system are related. While players will always be able to run, their rate of movement can now be limited based on the weight of their gear, their state of health, and the management of their stamina. Stunlock Studios' stand-alone spinoff in the Battlerite universe, Battlerite Royale has officially hit Steam today. Grinding Gear Games has officially launched the expansion for Path of Exile in the form of "The Fall of Oriath". Hirez Bart and Hirez Drybear today revealed the next upcoming patch notes for third person deity based moba, SMITE! Weekly Recap #357 April 19th - War Thunder, Fortnite, SMITE & More!